Spacious luxury lake front lodge located on the west shore of Lake Tahoe. The one and a half acres of landscaped grounds include a childrens playground and a 1,200 square foot guest house. In the Main Home, there is a grand living room with soaring ceilings, a massive wood-burning fireplace and a stunning wall of glass that frames the lake and the mountains beyond. The kitchen is a gourmet’s delight with the latest appliances and a spacious layout which allows for several chefs to work simultaneously. The house offers a movie theater, a billiard room, fully equipped fitness center and wine cellar. The completely private and separate guest house includes a small kitchen, living room, two bedrooms and two bathrooms. 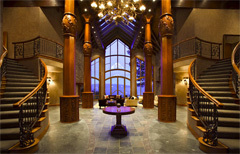 The lodge is located on the west shore of Lake Tahoe a couple of miles from Tahoe City. San Francisco is approximately 3 hours 45 mins drive away, Sacramento is approximately 2 hours drive, Reno is approximately 1 hour drive away.